Drinking games are a great way to have fun and get to know other people at parties. The 7-11 dice game is an easy drinking game. It requires very little skill and explanation. It can be played with 2 to 10 players. The game has several different variations. It is most often played with a shot glass of beer, but hard alcohol can be substituted for beer if you prefer. Set up your table with a shot glass and pitcher of beer in the middle. Your players sit in a circle around the table. Place the dice in front of the person who will be the roller. Roll both dice. Shoot for a 7, 11 or doubles. If any of those occur, the roller chooses a drinker from all the players. He pours beer into a shot glass. Drink the shot if you are chosen. Once the drinker touches the glass, the roller must roll again before your empty shot glass hits the table. You become the roller if he does not. If he does, he repeats Step 2. While rolling, the dice might end up on the floor. 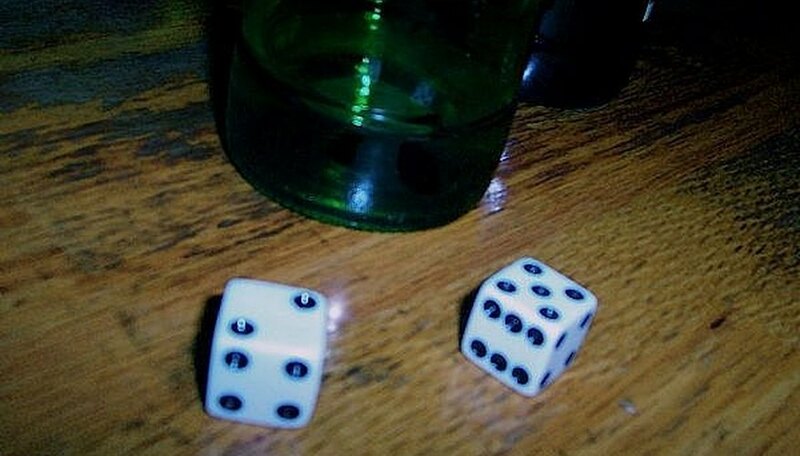 This is known as "sloppy dice," and the roller must drink two shots. The dice are then passed to the player on the left. There is no set ending to this game. It is over when the players decide it is. If a player is intoxicated, make sure he does not drive home.